America, you need to read this book. 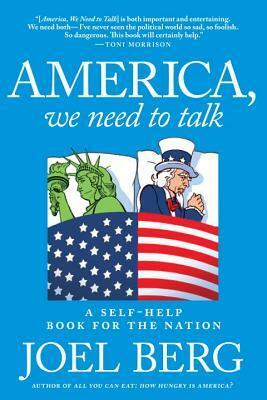 In fact, America, this is a textbook for how to get yourself out of the regressed state in which you find yourself. It’s more: It’s an encyclopedia of the reasons why we’ve come to this parlous state in our history, why our democracy is at greater risk than it’s ever been, how we have been lied to and cheated on – including to and by ourselves, the missed chances for righting our wrongs, and the abundant opportunities that are ours for the taking. This book is a paean to good sense and civic engagement; a laurel wreath for our forebears who fought for freedom – political, economic, cultural, and spiritual; and it’s a recipe book for how to make nourishing, delectable meals to build our moral strength and satisfy our souls. Joel Berg is that rarest of rarae aves: He’s a policy wonk of the first order, but he’s also an activist leader, a non-profit executive, a political operative blooded in battle, an eloquent and passionate voice for progress, and, to boot, he’s damned funny. In short, he’s the whole enchilada. His vast experience, his humanity and his intelligence spring forth from every page – all 600+ of them. You will learn things from Joel you didn’t know, you will remember things you’d forgotten, you will be inspired to pick up that doggone ball and run with it. We are at a crossroads in America today. What we have been seeing since the national catastrophe of Donald Trump’s inauguration as president and the onslaught of his racist, know-nothing administration is a tearing down not only of decades of social and political progress, bought with blood in so many cases, but relentless attacks on the very foundational principles of modern civilization: science, decency and civility, free expression, and tolerance. This entry was posted in articles, books, conferences, videos, special events etc., Trump Administration and tagged America - We Need to Talk, Jelani Cobb, Joel Berg, Mark Lilla by Bill Hewitt. Bookmark the permalink.